And for the most part, Happy Death Day delivers on its premise. College student Tree Gelbman (Jessica Rothe) relives the same day over and over, only to be murdered by a masked killer every time. She quickly deduces that the only way to break to the cycle is to unveil the identity of her attacker. 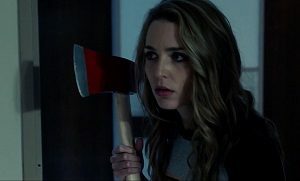 Happy Death Day very quickly establishes itself as a comedy first, horror movie second. In fact, after the first day, it fails to create even the merest sense of dread. It’s the problem with horror/comedies – once you play things for laughs (in this case, a death montage), it’s hard to once again summon the scares. Very few films – aside from Scream 1, 2 and 4 – have managed this tricky balance. Jessica Rothe (who was one of the housemates in La La Land) does an impressive job, especially considering that she is in every single scene. The entire film rests on her shoulders, so she really deserves props for stretching her comedy/action/drama muscles within the same film. In an amusing case of budget restrictions, 50 Cent’s “In Da Club” doesn’t appear in the film, despite featuring prominently in the trailer. Clearly they only had enough money for the latter. Instead, we get an awful stand-in mobile ringtone that, well, gets the job done. “Gets the job done” could apply to the production values generally. Whilst everyone knows that Blumhouse Productions make films on the cheap, Happy Death Day features some shoddy sets, sitcom-level wardrobe and merely good-enough VFX. It’s fine, considering the comedic nature of the movie, but this bland visual style reminded me of The Butterfly Effect more than anything else – another film that had trouble balancing its comedy with its sci-fi premise. This is a stupid film. But it knows that it’s stupid, so that’s all right. A brief 96 minutes, it doesn’t outstay its welcome, and whilst the plot revelations aren’t genius, I can’t pretend I saw them coming. If you’re up for a silly, amiable horror film that isn’t remotely scary, Happy Death Day is worth your time.